The middle school timeline is a lot more comical in comparison to the high school timeline. This episode builds on Chihaya, Taichi and Arata's characters, and sets the playing field for their dynamic to develop (and then crash and burn, by my predictions). See! It is two letters. 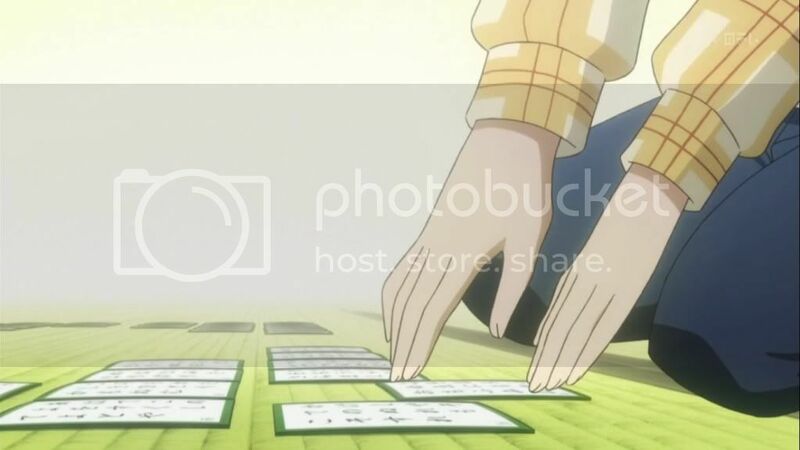 The episode is focused on the final Karuta tournament held annually at their school. We learned a little bit about Arata's circumstances in the previous episode. He's poor and from a village on the western coast. He spent his days playing Karuta and has developed a seriousness for it. His roots justify the juxtaposition of social shyness and competitive confidence he displays. This episode build a little on Taichi and Chihaya's backgrounds via the Karuta tournament. If only she would cheer for him, his little heart wouldn't break so. Taichi comes from a strict, reputed background. Despite his young age, he is expected to excel at everything he does and not do anything that he does not excel at. Therefore, to Taichi winning this tournament is of great importance to please his mother. As always, he also strives to impress Chihaya. Unfortunately, Arata seems to have her smitten with his passion for Karuta. This makes Taichi very jealous. Taichi's childishness in dealing with this jealousy is refreshingly realistic. Arata quickly nullifies Taichi's strong lead in the tournament. He's still treating cards like shuriken. The final round is a face-off between a confident Arata and a nervous Taichi. During the break, Taichi tries to rattle Arata with futile tactics like taunting and rigged peace offerings. All of his plans back fire because every mean thing he does to Arata increases his closeness to Chihaya. A frustrated and scared Taichi steals Arata's glasses to put him at a major disadvantage for the final round. Arata really can't see without his glasses. He's confessing to Chihaya, or so he thinks. Arata knows that Taichi has stolen his glasses because he recognized the blurry figure running away from the washroomwhere it was stolen from. 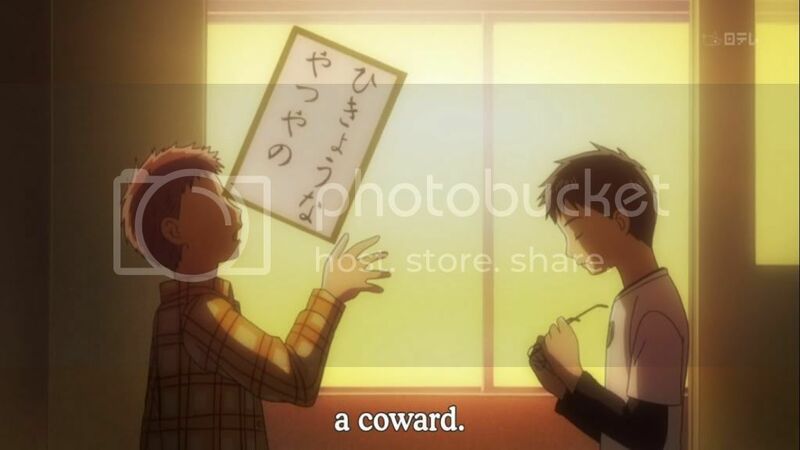 He tries to tell Chihaya (and fails due to his blindness), who defends Taichi's honour. Although Taichi is the playground bully, she insists that he is not sleazy enough to cheat. Her unwavering faith in him hits Taichi in the gut hard. 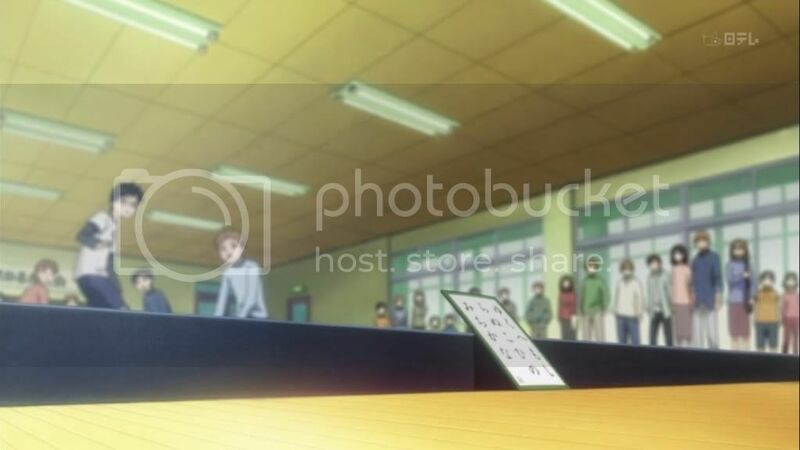 Chihaya exits to search for Arata's glasses as the two boys set up for the final match. Arata spends the beginning of the match peering closely at the placement of the cards. Taichi does not understand why he's trying so hard to win. Of course, Arata's Karuta pride is only half the push; the other half comes from his shonen desire to make Chihaya's word true. 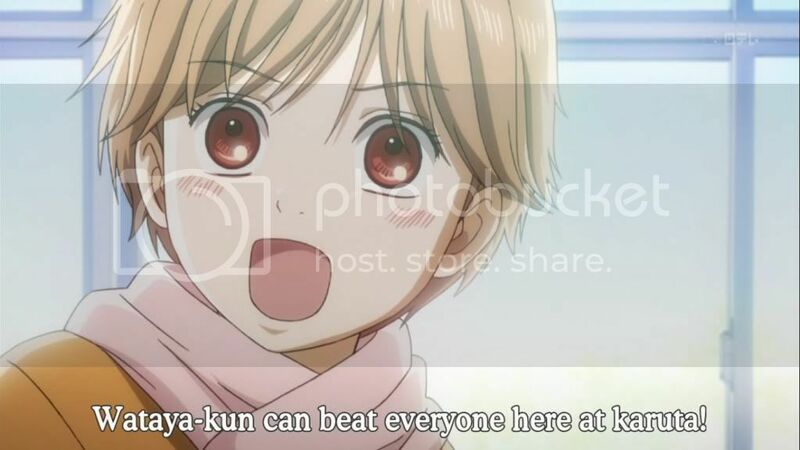 After all, Chihaya defended his "worth as a person" by insisting that Arata could defeat anyone at their school at Karuta. Her support for him has even gotten her excommunicated by the class. In Arata's eyes (however blind they may be) the noble thing to do is to prove that Chihaya was right in her claims. When they begin to play, Arata still pwns Taichi despite his severe handicap. 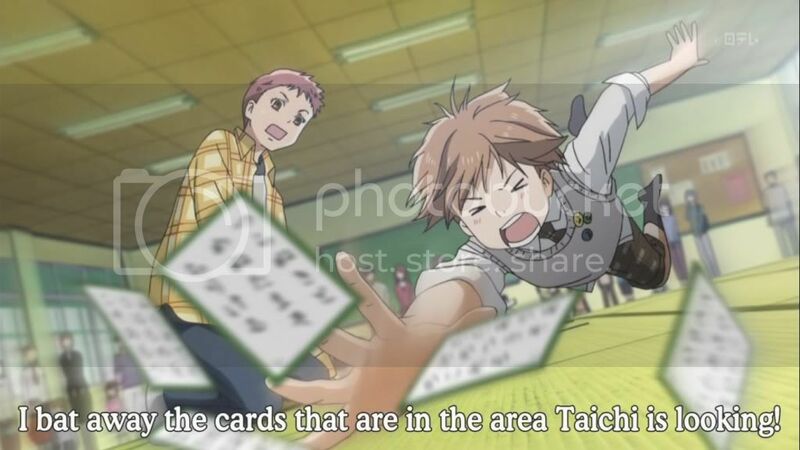 Taichi retaliates by swapping the placement of the cards after he realizes that Arata had spent his pre-game time memorizing the placement of each card. Watching Arata play and win purely from memory forces Taichi to realize how truly scary Arata's skill is. His guilt snowballs. She has the makings of a shojo heroine I may actually like. Once Taichi starts swapping cards, not only does Arata not know where the correct cards lie, his confidence in his skills start to waver. 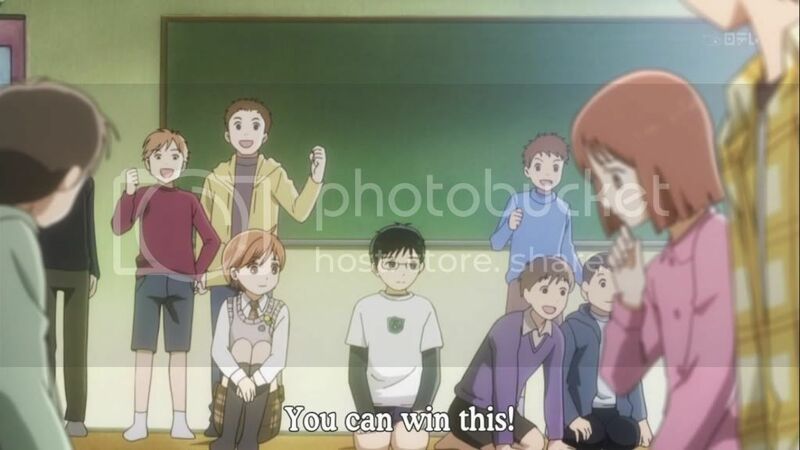 Just when he seems to lose hopes for winning, Chihaya asks to take over his place. While her intentions are golden, Chihaya conducts herself brashly and abruptly which creates a lot pf potential to physically injure people. Yet, I think it's these same qualities that are at the focal point of her charisma. While Arata was not able to keep to his word of winning the tournament without allowing any other players to steal a card from him, Chihaya still wanted to try and beat Taichi on his behalf. She calls herself his student - how cute. I don't think any official lessons have been exchanged yet. How overzealous. No wonder Taichi is inherently jealous. Chihaya plays very enthusiastically. She has about a third of the total poems memorized while Taichi knows them all. She's quick to pick out the cards which she's certain about. For the remainder of the cards, she watches Taichi closely as he analyzes the possibilities. As soon as he identifies a card, his face betrays his discovery. 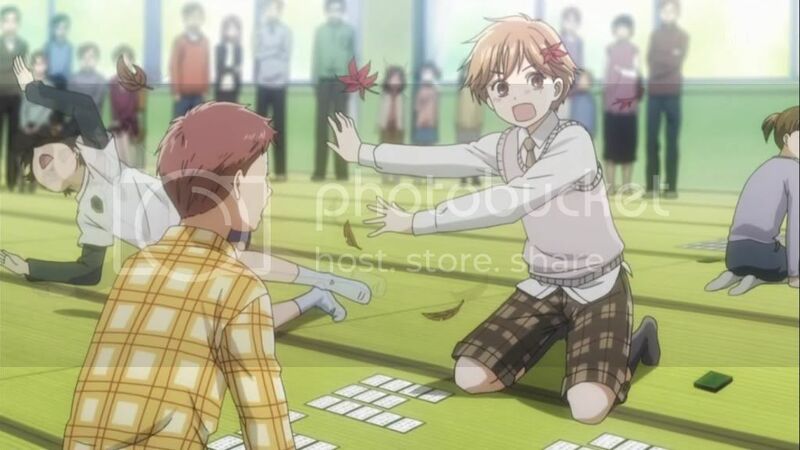 Chihaya moves quickly to disrupt all the cards in the general area where Taichi's eye falls. Karuta rules allow for a player to displace as many cards as they want as long as the correct card for the current poem is displaced in the pile. While this may seem like cheating, I like Chihaya's resourcefulness. She's so hellbent on winning for Arata and she does well to think outside the box. The score is tied and the last poem is being read out. This is the deciding round. Chihaya looks down at the remaining cards and does not recognize the first verses of any of them. She panics as she searches her memory frantically. The card in the top left corner catches her eye and she remembers something Arata once said to her. The first word of the first verse of the poem to which that card matches is Chihaya (innocence). So, Arata explains to her that by labelling that card the Chihaya (person) card he will never forget it. 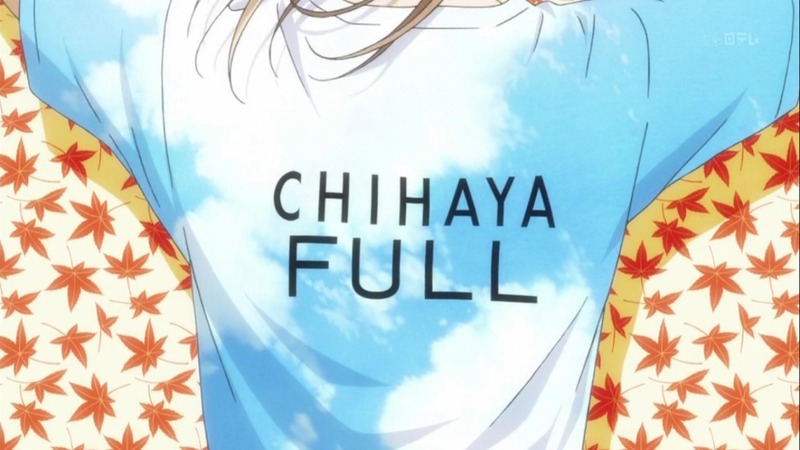 Chihaya listens closely for her name as she realizes the way a Karuta player seeing the world. Being Shojo, of course Chihaya wins as she grabs the card which matches her name. Arata steps forwards and tells her that if he's the Meijin (best male player) of Karuta then she is the Queen (best female player). I'm left to wonder why the women's titles are always so corny. Excited, Chihaya calls home trying to break the good news to her mother and sister. However, a modelling scout is visiting with vested interest in Chihaya's sister. Chihaya is dismised by her mother and ridiculed by her sister before being left alone to celebrate. She sets out to find Arata to see if he's found his glasses. She rendezvous with Taichi along the way and they find Arata in the classroom playing Karuta without a reader or cards or his glasses. While I thought he looked ridiculous both Chihaya and Taichi accepted him as the coolest thing since sliced cheese. Chihaya then bounces off to look for Arata's glasses again. All of life's emotions are dealt in Karuta cards. The two boys are left alone in the classroom. 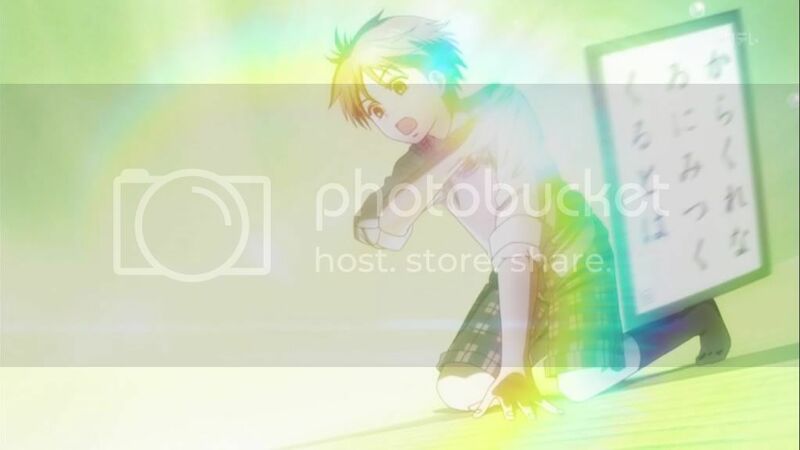 Taichi confesses to Arata that he had stolen the glasses and returns them to their rightful owner. He begs Arata not to tell Chihaya about this. In this one scene Arata probably shot himself into a favourites position. He calmly cleans his glasses and slides them on his face casually saying "Taichi... You're a coward." When Taichi is stunned speechless, he adds, "But I can understand why you'd do it." Sigh. If only real people spoke in such mature ways. 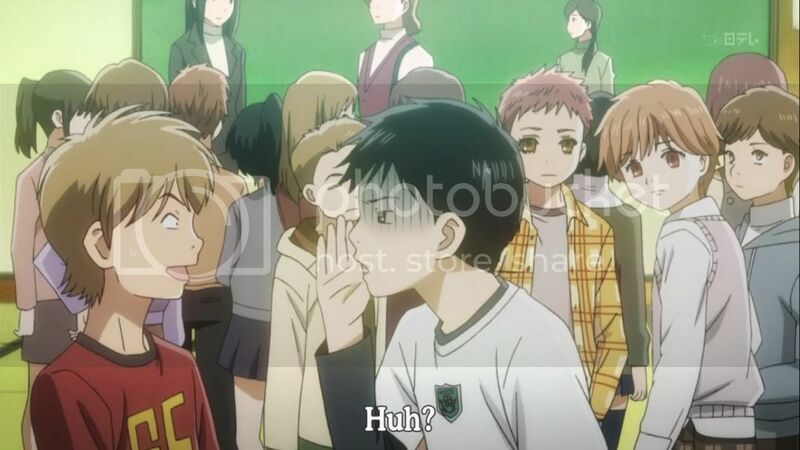 The episode ends with the boys searching for Chihaya behind the school. Chihaya has climbed up some tall trees and if peering into birds nests. 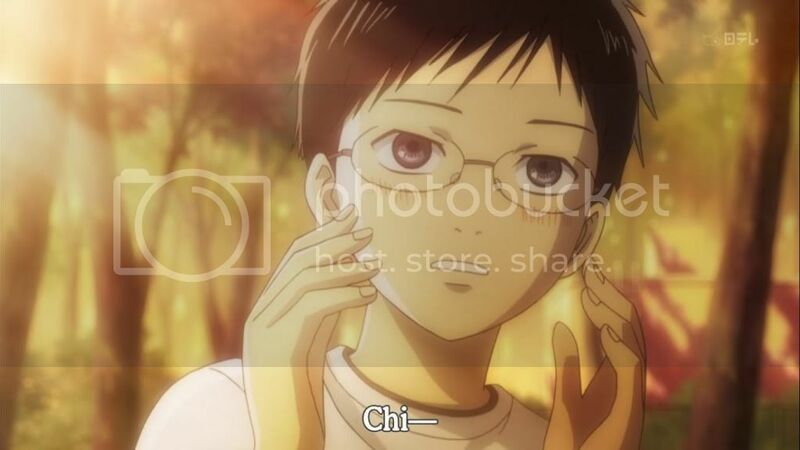 She's so loyal~ Seeing that Taichi calls Chihaya by her given name, Arata shyly tries his hand at it. If there is a battle between Taichi and Arata over Chihaya, Arata will not be the weak-spined character that he tends to be in usual social situations. I do like the fact that Chihaya and Arata's liking for each other is mutual. My biggest fear in watching this series was a scorned girl blazing through an unfamiliar world to exact revenge from a boy who ill-treated her once. (Skip beat anyone?) However, the balances in personalities for this series is working out well. I look forward to episode three.